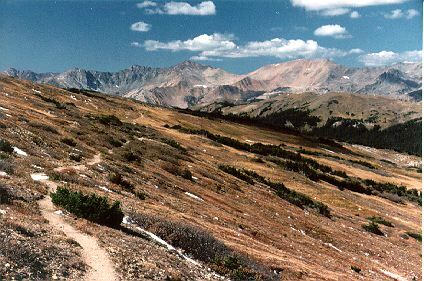 Path Looking West from the Alpine Visitors' Center on Trail Ridge Road. The beginning of the Old Ute trail. Starting elevation about 12,000 feet, ending at about 10,000 feet. The story is that this is part of the trail used by the Ute Indians to cross over the mountains on their periodic migrations.